Planting in containers is an excellent solution if you don’t have the space for a garden, if you live in an apartment, have poor soil, or just aren’t quite ready to invest the time into landscaping your yard. Planters and pots allow you to reap the joy of gardening without the chore of weeding and digging. Adding a pot or two (or more) to your porch, deck, patio or even indoors is an easy way to add visual interest and introduce you to the joys of gardening. Below you’ll find a table featuring the best pots for plants of 2017 along with their features to help you compare and contrast. They are organized by planter type and are listed in descending order by price. There are many different potting containers available. Each type has a different purpose for your potting needs. These are the pots you’ll find at gardening centers and nurseries when purchasing plants. They are typically made of thin, black plastic and are great for transplanting. They heat up quickly in the sun and are not insulated. 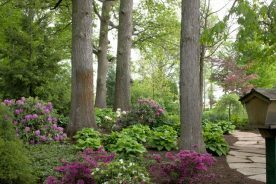 They can be used in shady spots, but are typically not used for long term planting. Planter trays and flats are rectangular boxes with trays having raised sides. They are usually made of black plastic and are usually solid. They can sometimes be grated to offer drainage. Trays and flats are typically used to hold small pots or inserts that are used to start plants from seeds. Inserts can also be purchased that are made from cells, usually about 3 inches deep, to hold individual seedlings. The inserts are usually perforated along the cells to make transplanting each seedling easy. Plastic pots are usually light in color and are meant to be used as a long-term planter. They are lightweight, and typically more affordable than other planter types. They usually have more drainage holes than ceramic pots and can easily be altered if more drainage holes are needed. The light colored plastic does not hold heat well so when used in sunny locations they won’t heat up too much and damage the plant roots. Sunlight, however, can degrade plastic pots and once broken they aren’t really usable. Some plastic pots may not last for more than a few seasons. Grow bags are what it sounds like, a bag in which you grow plants. They are light weight which makes them easy to move when full. They fold down nicely when empty so they hardly take up any space when not in use and makes transplanting easy. 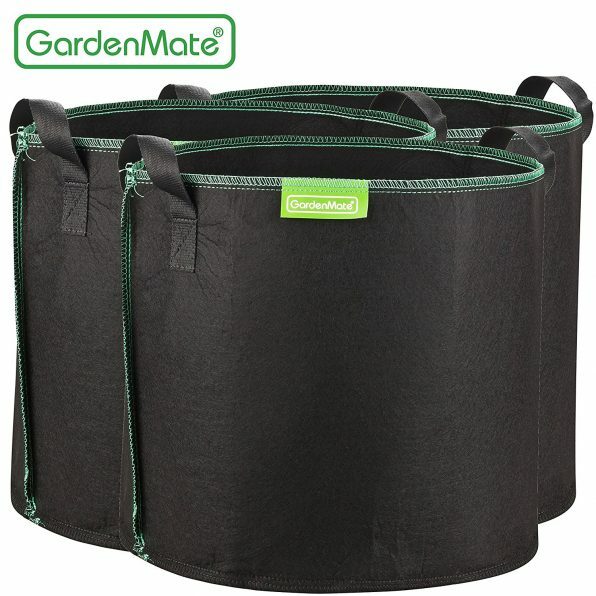 The bags generally have drainage holes and come in many sizes so you can use them for a variety of plants. They are made of UV resistant plastic so they are more durable in the sun. They are not as sturdy and solid as planters and can lean a bit if the soil is not well distributed. Grow bags are a great option for renters and people with not much space to store pots during the non-growing season. Biodegradable pots are made from some sort of environmentally-friendly fiber such as peat moss, paper, or wood pulp. These pots are designed to break down when planted so they make transplanting a breeze. They are typically smaller in sized and are used to start plants from seeds. When the seedlings are big enough the entire pot is planted in the ground. This is a great way to cut down on the waste you get when transplanting seedlings from plastic inserts or pots. The downside is the pots are not reusable. 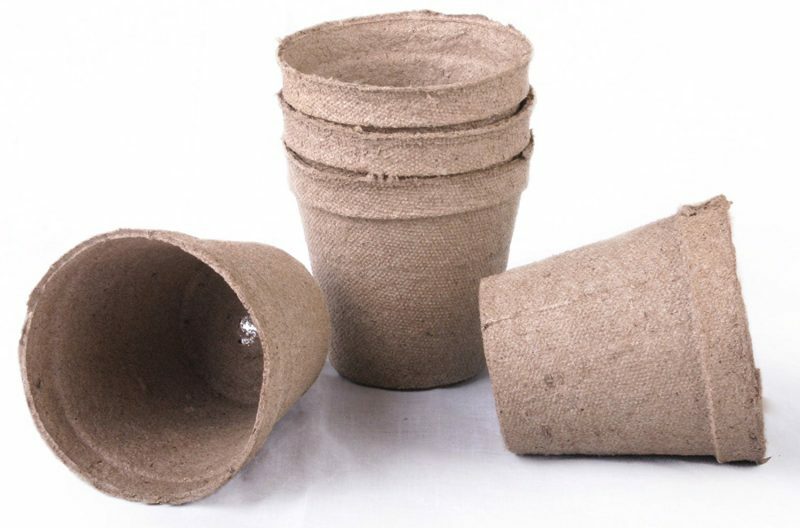 It is easy, however, to make your own biodegradable pots from toilet paper tubes or even newspaper. Decorative pots and planters are typically made from terracotta, clay, stone or sometimes concrete. They offer a lot of variety in terms of size and color and are generally more visually appealing than plastic pots. They are heavier and can be more difficult to move especially the very large pots. They are also more breakable and can be prone to cracking when the soil freezes and expands. Be sure the soil is not packed to tightly. These type of pots typically do not drain as well as plastic pots and more drainage holes may be required depending on the plant. The clay and terracotta, especially the unglazed ones, tend to absorb moisture from the soil which may require more watering depending on the plant. Some plants prefer dryer soil and love terracotta and clay. Glazed pots hold moisture a little better. These materials also hold absorb and retain heat from the sun which may damage the plant roots, depending on the plant. None of the materials can be damaged by the sun and pots outside will last a long time. Hanging baskets and pots are a great way to make the most of the vertical space you have. The look nice on decks and are great for people that are limited on space. They consist of a pot that is supported by wires or cords that come together at a hook to be hung. They can be made entirely of plastic with a plastic pot, cords, and hook. 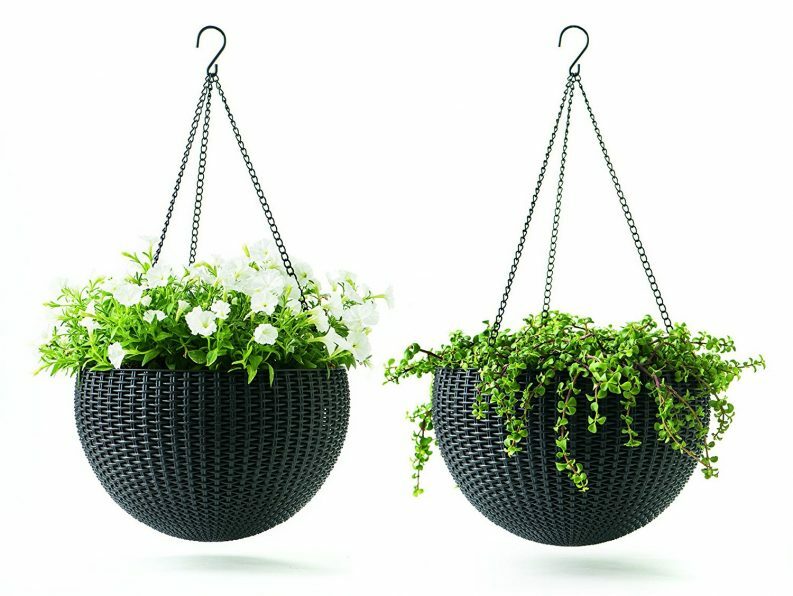 Hanging planters can also be made of a metal wire frame basket, metal chain and a metal hook. The metal frame is then lined with a fiber liner that acts as a water tray by absorbing moisture and draining the excess. The fiber liner can be made of synthetic materials such as recycled plastic or natural materials such as coconut fibers or sphagnum moss. Hanging flowers should be kept out of windy locations to prevent drying out the soil. They can also leak a lot of moisture when watered so considered keeping plants under the hanging baskets to minimize the amount of water wasted. Seed pots are small containers used to grow plants from seeds; they are not large planters. Once the seedlings have sprouted the plant is transplanted. Seed pots can be made of plastic or sometimes a biodegradable material. They can be individual small pots or a connected tray that can be split up when it is time to transplant. Self-water pots contain a hidden reservoir at the bottom of the planter that holds extra water that the plant can absorb as needed. They are typically made of plastic and, as a result, are lightweight. This is an ideal planter for small plants that need frequent watering and indoor plants that can tolerate wet conditions such as a peace lily. These types of pots are also useful for hanging plants that receive a lot of ventilation and will be less likely to dry out or to be used in places that may be hard to reach with water. Self-watering pots typically have a plug at the bottom. If you use the planter outdoors be sure to remove this plug otherwise the planter may overflow with rain causing the plant to drown. Wooden planters are very attractive and can add lots of character especially when combined with other features such as a trellis or bench. They make great outdoor planters. Depending on the type of wood used and the size wooden planters can be mid-weight compared to ceramic and plastic. 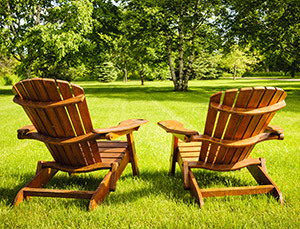 Wood provides good insulation for the soil which can help protect the roots from sun and heat. The wood can sometimes split or the metal bands or nails holding it together may rust. The wood may also begin to rot, especially the bottom, if it remains wet for too long. Elevating the planter may help keep the bottom dry. You can also use a plastic liner inside the wood to protect it. Wood is very durable and will stand up to cold weather. It is an ideal choice for large container gardening and may require a sealant to be applied annually to maintain the wood. Metal planters are typically used as decorative containers, such as an old wash basin. Metal is very durable and won’t chip, crack, or break, but can be heavy when filled with soil. The metal doesn’t insulate the soil and can get very hot in the sun causing the soil to dry out. The best way to avoid this is to use a plastic liner in the metal container. Metal is not porous so it retains water very well. If drainage holes are not provided be sure to drill an adequate amount to ensure the soil doesn’t become saturated with water. Below we’ve listed the best flower pots and planters of 2017. Included is a short description along with the pros and cons of each planter. The Jiffy Peat Pots are a great container for starting plants from seeds. Fill the small-capacity pots with potting soil then add 2-3 seeds per pot. Water the pots as usual until the seeds sprout. You’ll only want one seedling per pot so if more than one seed germinates you’ll need to remove them so only one remains. Once the seedlings are a few inches in length the entire pot can be planted in the ground or into a larger pot to begin growing. The Jiffy Peat Pot is made from biodegradable peat moss. By burying the entire pot you can avoid the root shock that comes from removing plants from their original plants. The Fiskars 3-gallon box planter is a great size for your patio or deck. It will look equally great indoors if you have the floor space. 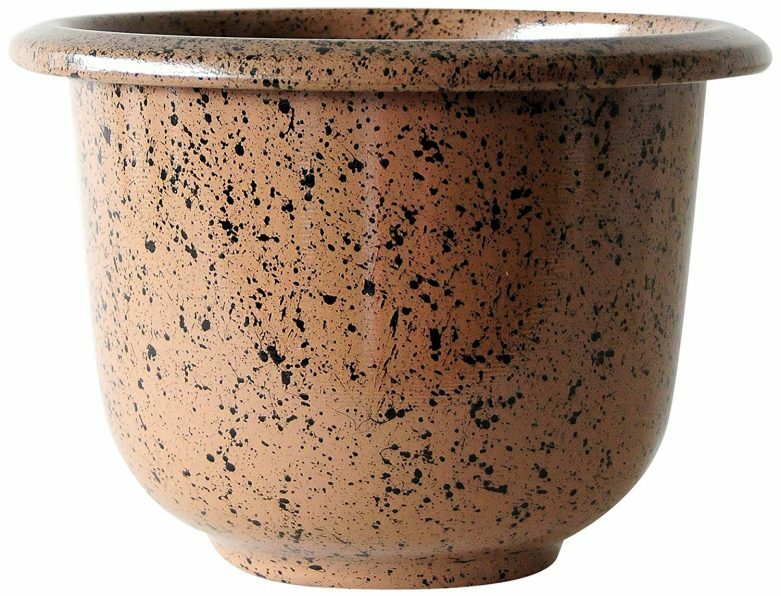 The decorative design of the pot will add style to your deck even when you plants are just beginning to grow. The top of the planter is wider than the bottom making it easier to add soil and plants. Drainage holes are provided, but needed to be punched out before using. The planter that is UV-resistant and weather proof so you don’t need to worry about it fading in the sun or cracking in the cold. 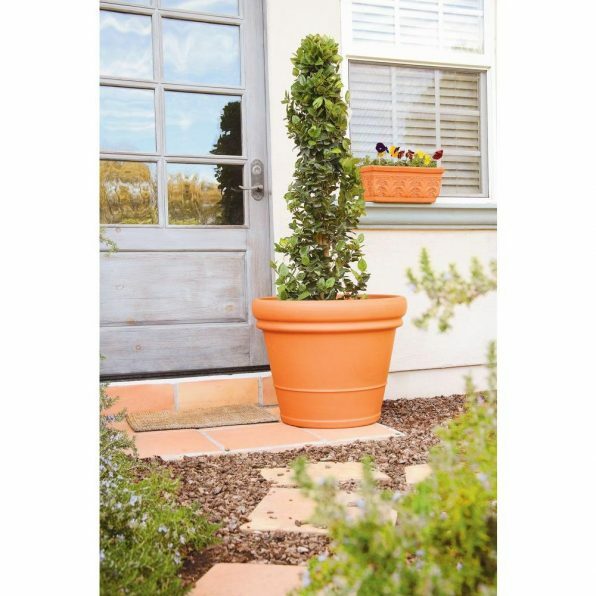 The round Glazetone Planter is a heavy-duty steel planter coated in enamel to protect it and prevent rust. The handsome enamel comes in many different colors and the planter comes in three sizes to allow you options for all your planting and décor needs. The planter has one drainage hole in the bottom with a rubber stopper if you don’t wish to use it. Depending on what you plant one drainage hole might not be enough and you made need to drill more. The bottom of the planter has rubber feet built in to raise the planter to allow water to drain easier. These rubber feet are approximately ¼” deep. If you use the planter inside you’ll want to keep a tray or dish under the pot to catch the water that flows out of the drainage hole. 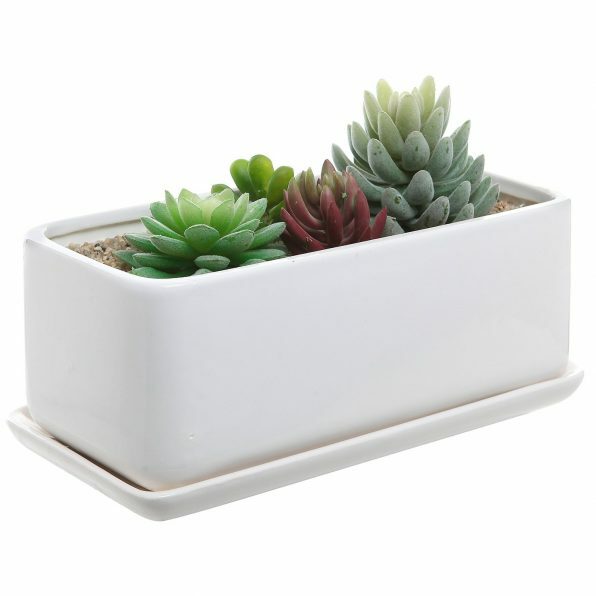 The Modern Minimalist Planter is a stylish planter made from glazed ceramic. It has a simple, rectangular design which looks great with any décor. Two drainage holes are included on the bottom and the planter comes with a drainage tray to catch water from the holes. 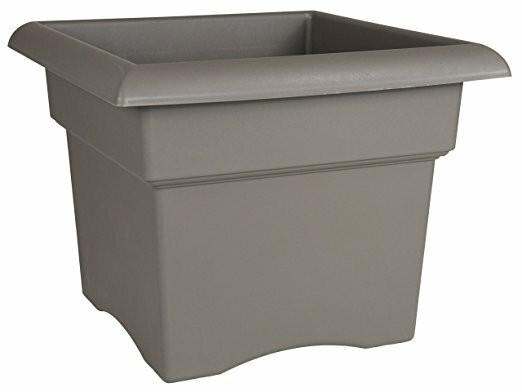 The planter is on the smaller side and is best used for small, slow-growing plants. Fast-growing plants will quickly outgrow the planter and will need to be transplanted. This planter is best for indoor plants. Keeping the planter outside during extreme temperature changes may lead to cracking. 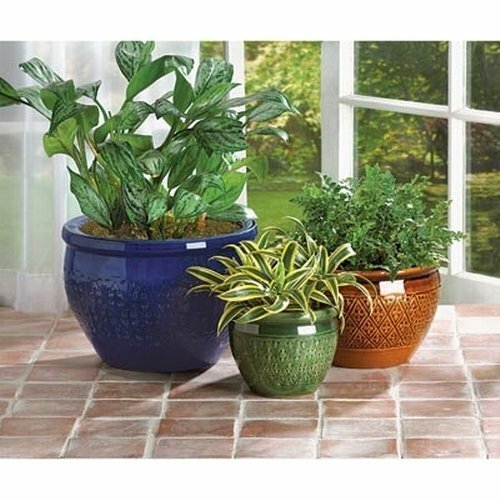 The Jewel Tone Flower Pot Trio is a great way to show off your houseplants in a nice arrangement of three. They are made from glazed earthenware and won’t absorb moisture from the soil which can cause the soil to dry out to quickly. Instead the glaze permits the soil to hold the moisture allowing the plant to slowing absorb water as needed. One drainage hole is included in the bottom of each planter. The trio of planters are best for growing houseplants or if you use them outdoors during the growing season bring them inside for the winter. The cold may cause them to shatter. Terra Cotta is one of the oldest types of pottery and the most natural medium in which to plant, other than the earth. The material of the planter is porous which absorbs moisture and allows the roots of the plant to breath. It allows oxygen to reach the soil and maintains a balanced temperature for the plants. Drainage holes have been added to the bottom to prevent overwatering and the plater can be used indoors or out. It is a heavy-duty pot and can be difficult to move when it is full. If using on your wooden deck or porch be sure to use a drainage try under the pot to catch extra water. The walls are thick which makes it suitable to sustain cold weather. These stylish hanging planters look like they are made of wicker, but are actually made of durable plastic resin. The hanging baskets even have the same texture as wicker. The resin, however is weather resistant and won’t fade, peel, stain, or dent in even the harshest conditions. The hanging planter can be hung using the three attached, rust-resistant chains and can hold up to 33 pounds. The wicker outer bowl is lined with a sealed inner bowl with a drainage hole and plug at the bottom. The plug must be removed before planting so keep that in mind before adding dirt. The drainage hole is a bit large and can become clogged with soil. Line the bottom of the planter with rocks to prevent this. Garden bags are a great solution for someone that wants to start a vegetable garden and doesn’t have the space. The bags are made of synthetic felt and at are the perfect size for most vegetable plants. The fabric is breathable allowing air to enter and excess water to drain which helps aerate and water the roots as well as prevent mold from growing. Handles are located on the sides to help move them when full. You might want to elevate them if you use them on a wooden deck. The bags are well made and when used as garden pots don’t flop over when full. The best part of the bags is they fold flat for easy storage during the off season. The Panacea Window Planter is a classic-looking planter to add to a window, fence, or rail. The flat iron hanging flower basket is made from powder-coated steel which is rust-resistant and will hold up to the elements. It includes a coco liner which contains the dirt and allows excess water to drain. Water will drain, but the soil will stay in. 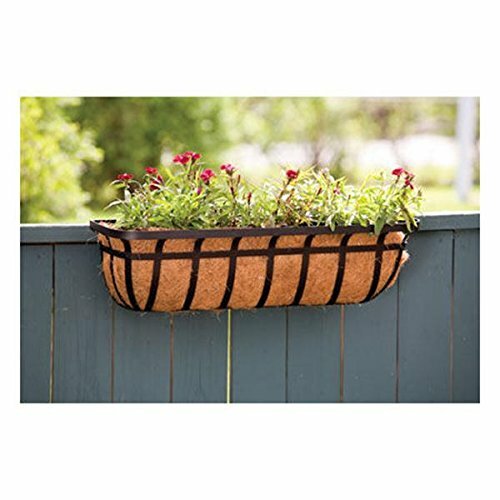 The long planter offers plenty of space for flowers or vines to grow and spill over the sides. Brackets and hardware are included to mount the planter. The brackets are a bit wide, so if you have a thinner fence you may need to use zip ties at attach the planter. 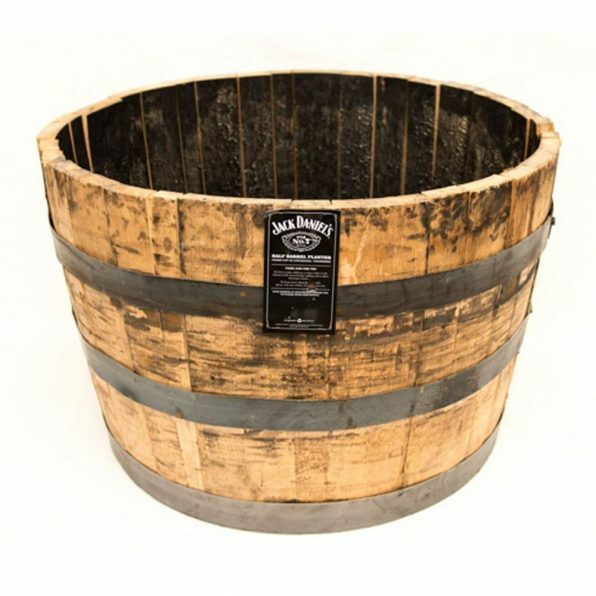 Add some rustic charm to your yard with an authentic, recycled whiskey barrel planter. These large large-capacity planters are extremely heavy-duty and will last for many years. Because of the large size you may want to place the planter on casters to help move the planter when full. The planter does not have drainage holes included so you’ll need to drill your own. You may also want to line the barrel to reduce the chances of wood rot. What kind of plants should I pick? When selecting plants for an eye-popping display consider planting groups rather than one single type of flower per pot. Try to mix color, texture, and leaf types and balance proportions. This can be achieved by planting in threes. You’ll need a thriller, filler, and spiller. Thiller would refer to a plant that offers height. These go in the center or back of the container. Fillers are medium-sized plants that fill out and are placed in the middle of the container. Spillers refer to plants that trail or cascade over the side of the container. These are placed at the front of the container. Don’t use more than three to five plants per pot otherwise it can look crowded and messy. Select younger plants and let them grow to fill out the container. Be sure to select plants that need the same water, sun, and soil requirements. What type of soil do I use in a potted plant? 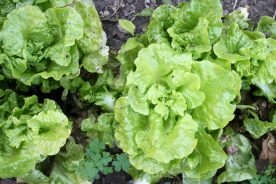 Garden soil is often too heavy for container planting and can sometimes introduce disease. Use potting soil or make your own mix. Potting soil contains sterilized soil that is light and fluffy and drains well. There are also mixes that do not contain soil and are made of peat moss, compost and perlite. These mixes are lighter than potting soil, but do dry out faster. This is ideal of some plants such as succulents. 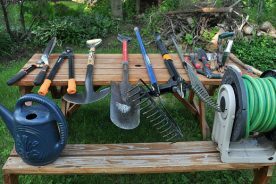 To make your own potting soil combine five parts fully decomposed compost, one part sand, one part perlite, and one-quarter part dry fertilizer. The fertilizer should be a slow-release formula. How often should I water my potted plants? This will depend on the plant, but the general rule is to water when the top two inches of soil is dry. What you plan to put in your planter will determine the type of planter to look for. If you are planting a mix of different plants you’ll need a container that is at least 12 inches wide. Annual flowers need the soil to be at least 8 inches deep and grasses or shrubs need soil that is 20-30 inches deep. Containers should have straight sides or should flare out at the top to allow for easy access when planting. If you are placing the pot on a deck or porch you’ll probably want light weight material such as plastic or metal. If your deck or porch is made of wood be sure to place a tray under the pot to catch water that has drained. Otherwise the area under the pot will stay wet which will eventually cause the wood deck to rot. You can also use a plant stand or otherwise elevate the planter.